Our lightest roast offers a delightful surprise. It took the gentle coaxing of our unique lighter roasting style to draw out the sparkling flavors of these Latin American and East African beans. The bright, crisp flavor and subtle complexity of this delicate brew shines through to create a breezy, deliciously easy-to-drink cup. * It’s tough to tell the difference between a Starbucks caffeinated and decaffeinated coffee. 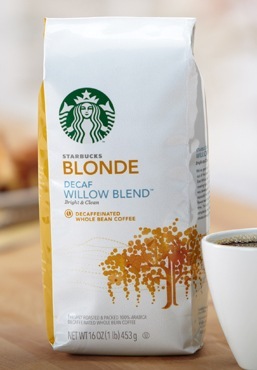 Our decaf versions deliver the same great taste and quality, just with less caffeine. It is a cup for those who know what they want, and more to the point, what they don’t want.